Welcome to Prepaid Phone News' regular Sunday Prepaid Phones on Sale this Week post featuring listing all the best US prepaid phone deals. 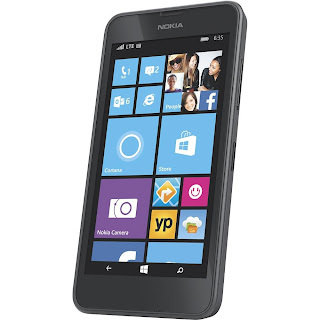 My Deal of the week pick is the AT&T Nokia Lumia 635 LTE Windows Phone $54.78 (reg $99.99) at Amazon and Walmart. The 635 has excellent specs for $55 or even $70. It has LTE support, a 4.5 inch 480 x 854 pixel Gorilla Glass screen, quad-core 1.2 Ghz Snapdragon 400 processor and a 5MP autofocus camera. It runs the latest Windows Phone OS 8.1 with the Cortana Voice Assistant. BestBuy Free shipping on orders $25 and up. Verizon (or PagePlus) Samsung Galaxy S4 i545 16 GB LTE Android phone (seller refurbished) $197.95 Free shipping. Verizon (or PagePlus) Motorola Moto X 32GB XT1060 Developer Edition LTE Android phone (new) $197.95 Free shipping. Second month of service FREE when you port a number from a non-T-Mobile based service to PTel, activate it on a $35, $50 or $65 plan and pay for the first month. AT&T Alcatel C1 Android phone $47.99 (reg $59.99) with Walgreens Balance Rewards loyalty card (weekly ad pg 19). Updated 1/24: New Groupon deals. I think that Target Desire 510 deal for Boost was last week. Don't see any phones at all in this weeks circular. You are correct. I've removed it. I like these posts. But there aren't any good deals this week. How about the HTC One M7 at Best Buy for $200? Good find, I've added the HTC One for AT&T and Sprint and Verizon MVNOs. I just ordered the blue AT&T version. The silver one is only in stores, and I could not find a store near 15 zip codes that still has one. It looks like only the blue versions of Sprint and Verizon HTC One M7 can be shipped, and the other colors have to be located by zip code. Dennis: Move the Best Buy links for the HTC One over to their section, away from Amazon. Add the black and white Moto X model 1058 for AT&T, $199.99 at Best Buy with free shipping. Best Buy also sells the Unlocked Moto X, XT1053 that works on both AT&T and T-Mobile, in white for $270.99. Although you can find this phone on eBay and Amazon for $250-$260, you cannot be sure to get the Motorola warranty. That does not transfer to second buyers. FreedomPop just sent me an email offer: ZTE Force LTE phone for $25, with free shipping.